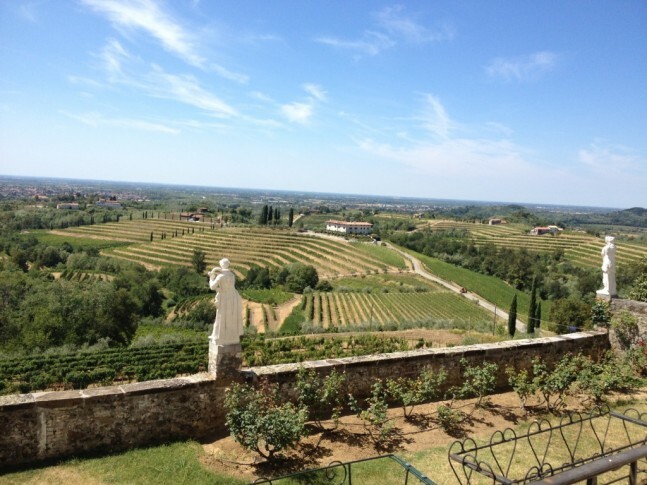 Our Wandering Palate Shanghai correspondent, Michael Knuppel, is ‘wandering’ the hills of sunny hills of Friuli, soaking up the wine and culture in delirium. The voice of “Ken” kept telling me that I had indeed reached my destination, but for the life of me I couldn’t find Number 1, Via Risorgimento, Brazzano. And I needed to, quick. I was already running late to meet the charming, most engaging and hospitable Elda Felluga, one of Livio’s three children who drive this high end, precise, passionate Italian winemaking family. I’d already been pulled over by the carabinieri for a spot check just out of Tolmezzo; I needed diesel, and here I was driving around Brazzano, a small, divine Friulian village looking for signs. I needn’t have worried. I found Felluga easily. I was stopped outside the Villa in fact, cursing Ken until I realized he actually got it right. The hospitality centre is understated, easy to miss, unlike Livio Felluga’s amazingly unique, iconic labels which celebrate the map Livio ‘created’ of the region dating back over 50 years. 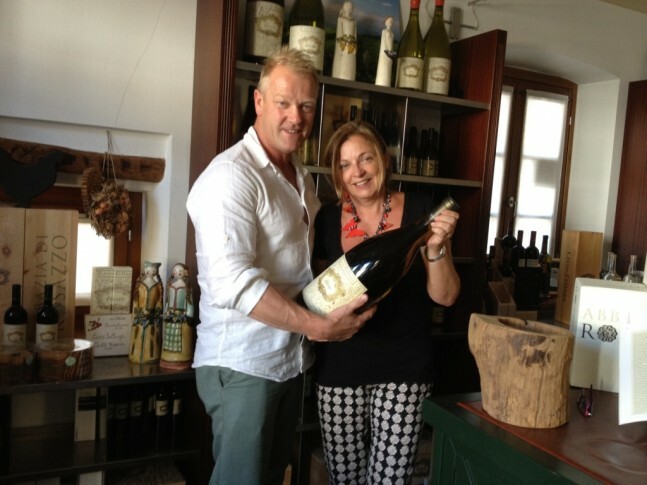 Elda and I…try getting this bottle through Shanghai customs!! 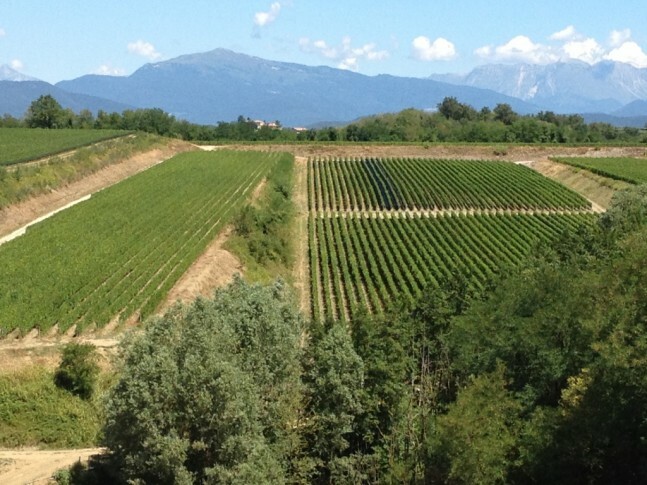 Felluga are famous for championing Friuli indigenous varieties such as Tocai Friulano, Refosco and Ribolla Gialla. With Sauvignon, Pinot Grigio and blends such as Sharis rounding out their white wines, it is the next level of blended whites that fascinate me. The Terre Alte, recently voted Italy’s white wine of the year and consistent tre bicciere wine, is a glorious blend of Friulano, Pinot Bianco and Sauvignon. I had previously already snuck a bottle onto our table while we were in Chianti, gob smacked that my local Carrefour express had it behind the counter. Few wines salute the going down of the sun as well as this wine, with light canapés, though I’m sure to get some hate mail now from Orvieto and Vermentino lovers! 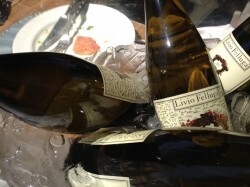 The Illivio, created in 1998 by the sons of Livio and dedicated to him for his eighty-fifth birthday, is a blend of Chardonnay, Pinot Bianco and Piccolit. It aims to reflect the personality of the “Patriarch”, combining strength and elegance. It is a fascinating wine which sees extended oak treatment, the barrel ferment giving the florals a creamy, broader texture; very long palate, strong structure, but again some lovely acid and fruit power to take on most Asian food. 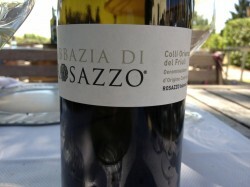 Lastly, a wine you will struggle to find outside of Italy; is the homage to the Abbey in Rosazzo. The Abbazzia di Rosazzo is a superbly aromatic, balanced, highly perfumed blend of Friulano, Pinot Bianco, Sauvignon, Malvasia and Ribolla Gialla. Andrea tells me it sits alongside Terre Alte, or High Land, as the most prestigious whites in the portfolio. I enjoyed these wines at lunch with both Elda and Andrea, sitting in their gorgeous Osteria Terre e Vini. In glorious sunshine, the mountains surrounding us, Elda shared the story of how the family were persuaded to purchase the ageing Osteria and reinvent it as a wine complex; one part Osteria serving local fresh produce; one part hospitality centre for guests, one part cellar door. Last week when I visited, the place was busy with locals, from businessmen to couples of all ages, enjoying clean, simple food rich in flavor and presentation. I am pretty sure it was Elda herself who did the persuading, and she commands a warm matriarchal control over the business. Of course, I am also a sucker for refosco, a wine at its best when its generous berry and plum flavours are given free expression and not overly cloaked in oak. The Felluga Refosco is just that; layers of brambly, almost spicy berry fruit with gorgeous floral notes of aniseed and violet. This was a 2007, and I was really surprised at how fresh, how vibrant it was. I wished I could carry a few cases home. Sadly, I was limited to a bottle. Apart from this wine, there is a partner to The Sharis, named Vertigo, a blend of cabernet and merlot and, lastly, the flagship red wine is the infamous Sosso, again a blend but this time of Refosco, Merlot and Pignolo. It serves as the Reserve red from Rosazzo, and has a deep, almost impenetrable red hue. The nose is elegant and complex, with notes of ripe plum fruit, dried tomatoes, red berries, some light spice and earth. It’s a tightly woven wine, with silky tannins and long, lingering, aromatic fruit flavours of mint, myrtle, white pepper, dark chocolate, blackberry and sweet spices. We had started our tour with a visit to the Abbey. It houses the oldest cellar in the region, and there are plans for this to be converted to an active tasting room. The Abbey sits proudly atop the hills in Rosazzo, overlooking the sprawling vineyards below that now are in the safe hands of Felluga. It is a divine space and a spiritual home if you like in more ways than one. To stop here, as the first place to visit, now makes complete sense to me, for I could see the context for these wines, the vision of Livio all those years ago. You need that if you want to understand the wines, I am sure. 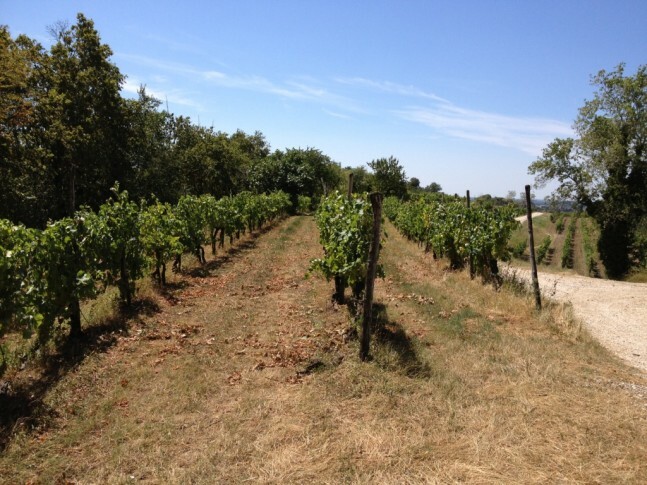 Later, Elda drove me round the vineyards, through the prized Rosazzo that provides the fruit for Terre Alte, and is the highest vineyard they possess. Lunch and sitting down with both Elda and Andrea, I couldn’t escape the powerful connection they have to the land and naturally their wines. Over a glass of the Friulano and then the Rosazzo, and finally espresso and the treasured dessert wine Picolit, I was made to feel completely at home. With two kids in tow, Elda even invited us to stop at one of the guest rooms to freshen up, to rest before our next journey. It’s this hands-on, truly passionate approach to not only wine, but to life in general, which makes Felluga an absolute stand out place to visit if you can. You will be welcomed as a friend. I drove away from Elda and Felluga and headed for the hills of the Veneto, to continue my Italian wine odyssey. I had lived in Friuli 20 years ago, and it was nice to be back, to speak the language, to listen to both Andrea and Elda share their family’s stories, their vision for the future, the excitement when I told them how perfectly suited their wines are to most cuisines, but especially Chinese cuisine. In Felluga, we get everything one knows about Italian culture: generosity of spirit; passion for land, family and life; history and progress; hospitality and sharing. When you next open your bottle of any of Livio Felluga wine, and I urge you to march out and get some right now, you will taste the terroir, the sun, the hills of Friuli. Beautifully judged acid which will slice through any oil based, spicy dish, and the full, round fruit driven palate of most of their wines really does enrich the flavours of most foods. It is what I tried to say to friends who didn’t know Friuli all those years ago, about the uniqueness of this land, and how these wines reflect this, and couldn’t. Livio Felluga has the words in every bottle. Their excellent website gives you an extensive background into their history and terrific tasting notes for all their wines.